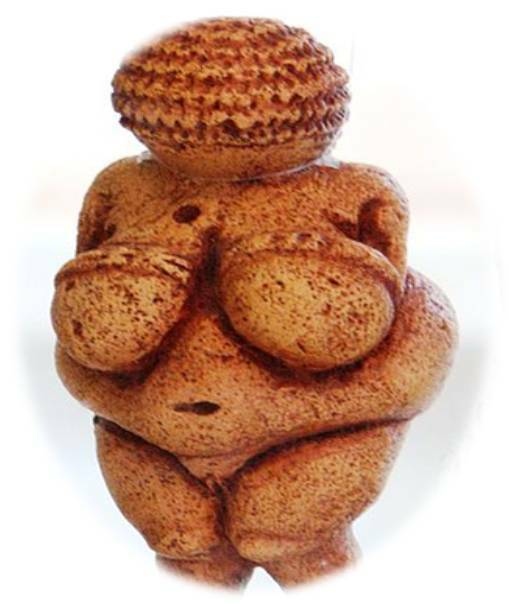 The Venus of Willendorf is perhaps the most famous of venus figurines, although it is not the oldest. Dating from between 24,000-22,ooo years before present, the Venus of Willendorf is carved out of oolithic limestone, and coloured with red ochre. She was unearthed in 1908, outside the village of Willendorf in Austria. The area was well-known for its paleolithic history prior to her discovery. There has been much debate as to whether the pattern on the head represents hair, a head covering of some sort, or whether it is only that, a pattern. What is noteworthy, is the lack of facial features. Obviously, from the rest of the figurine we know that whoever carved it had a great understanding of the female form and as we have already mentioned, the detail given to other areas is striking. So why no face? The most often-quoted explanation is that she represents some kind of paleolithic goddess, although there is much debate surrounding this theory. The figurine now resides in the Naturhistoriches Museum, Austria. This entry was posted in Pagan Academia and Learning and tagged earth goddess, earth mother, earth mother goddess, mother goddess, paganism, paleolithic, spirituality, venus figurines, Venus of Willendorf, wicca, witchcraft. Bookmark the permalink. There was a jewelry designer about 20 years ago, his name was David something. He made sterling bracelets and some had a similar goddess charm at the clasp. They were really cool. I wanted one but never got one. cool post. I just Googled in attempt to find but cannot. Much love. Forgot to say thanks for such a geat post. To me, the fact that she has no face suggests that it is because she represents or protects every woman. Thank you – Brightest Blessings to you. Nothing found on this site should be considered as a replacement for any kind of professional or medical advice. If you feel unwell, you should always consult your GP. I am not responsible for how readers choose to use information found on this site, or the outcome of any kind of magickal working.